Cathy at Words and Herbs hosts the Tuesday View, encouraging garden bloggers to display a photo of the same view of the garden week by week to observe the changes. I took photographs of the meditation circle around 8:00 a.m. Tuesday but did not have time to post until now. The top half of the weekly view is filled with bright light rushing in from between my house and the next, while the circle and much of the garden lingers in shade, making it challenging to get a good picture. Every week I participate makes me want a new camera, but I am gently assured by my family the quality issues rest in the photographer not the camera. We are still getting some storms but no longer daily. The heat index is high, air is thick and heavy. Mine is definitely a spring garden and in summer I spend little time tending the plantings. 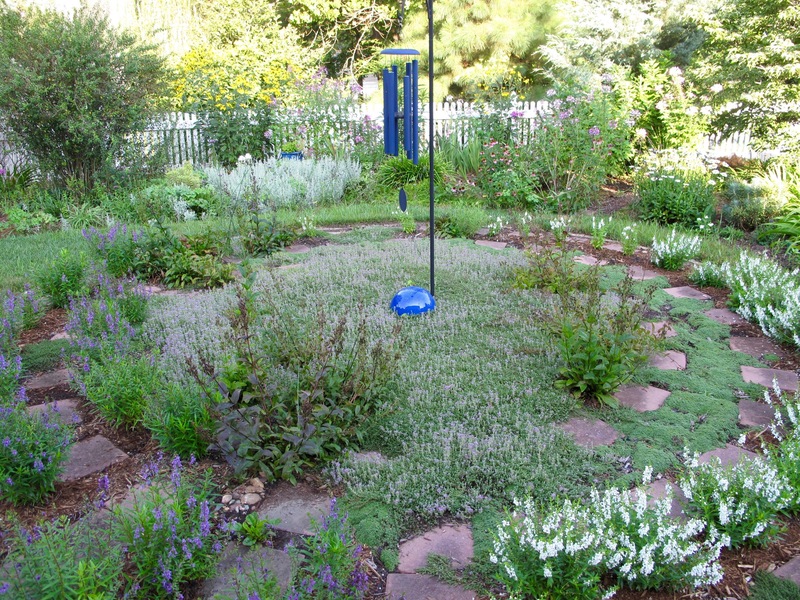 After experimenting with a range of finicky perennials, I found this low-maintenance scheme of commingling various thymes in the center of the labyrinth and using purple and white Angelonia to form the walls along the path to be reliable and effective. While the borders start fading under the hot sun, the meditation circle retains some level of dignity. During a yoga retreat this past weekend I walked a seven-circuit labyrinth, shaded by lovely old trees and accented with the lively sounds of birds and ocean. Growing against the back fence, Rudbeckia laciniata (Green-Headed Coneflower) and Cleome hassleriana (Spider Flower) are not a combination I planned, but they are survivors beloved by pollinators. Thanks to Cathy at Words and Herbs for hosting the Tuesday View. 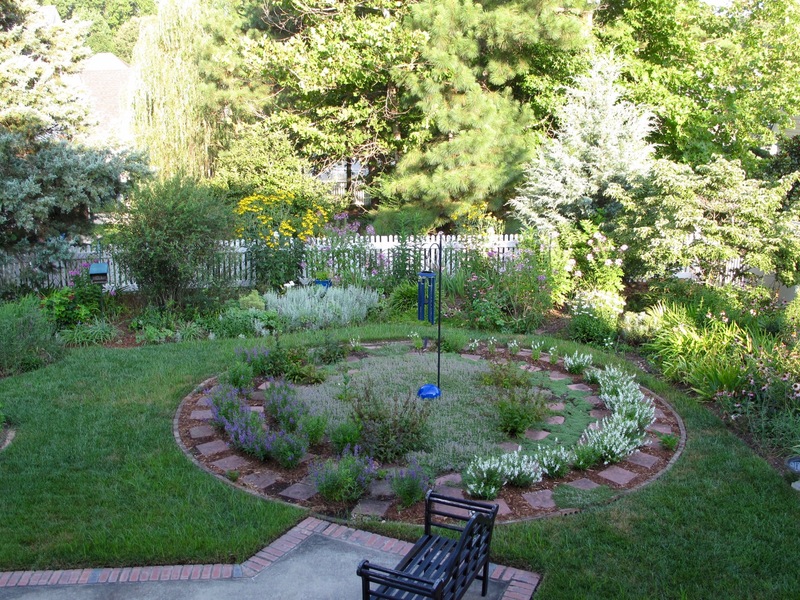 Check out her featured view and those of other gardeners. This entry was posted in garden and tagged Cleome hassleriana (Spider Flower), labyrinth, meditation circle, meditation garden, meditation path, Rudbeckia laciniata (Green-Headed Coneflower), Tuesday view on July 20, 2016 by pbmgarden. It looks extremely welcoming in the shade Susie, and walking it early in the day must be a pleasure before it gets too hot. I really love the white Angelonia that are filling out so nicely and look even lovelier and fresher when in shade. And the silvery foliage below the rudbeckia is also very cooling, as are the blue accessories. I think your photos are always excellent by the way, but know how it is when a shot doesn’t do justice to what you see. 😉 Have a lovely week Susie, and hope you get a cool breeze soon. Thanks Cathy. It’s definitely best to get out very early these days in order to enjoy the garden. 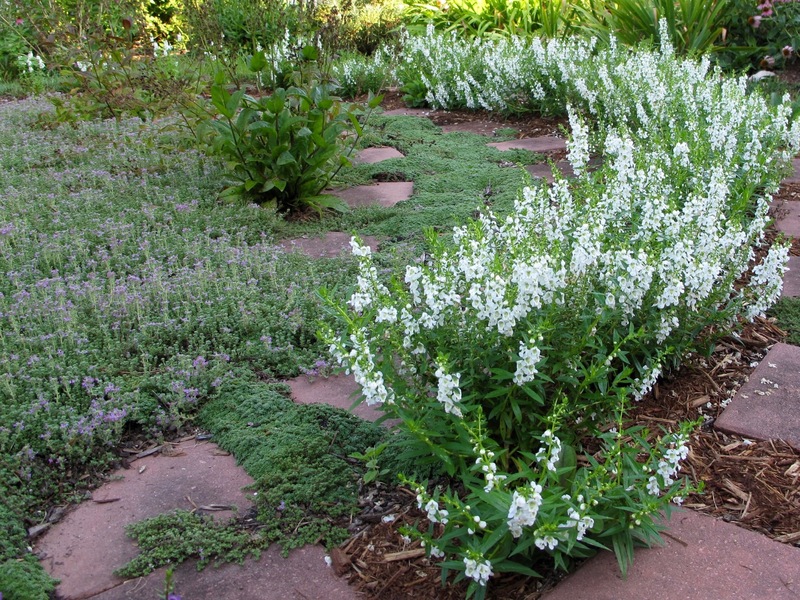 I love white flowers and the angelonia shows up well in early morning and evening. It gets better each week. Thanks John. I can see some things shrinking back from the heat. Hope the green lasts a while longer. There are I think four different thymes. They spill over the pavers in a way I love, until finally they cover the pavers and I need to trim them back. It’s taken a few years. I’ve areas like that with sharp lighting differences too – shooting under cloudy skies seems to be the best solution but that isn’t always an option. I love the cleome and wish I’d planted some this year – they seem to handle the heat here too. That’s good advice Kris. I should shift away from that early morning view and try other times. I’m looking west so often the sun is intense. Cleome are intriguing flowers. The thyme seems a perfect solution; low maintenance but high fragrance. Love your Monday vase. Those Dahlias are so intense. Thanks Linda. Oddly most of the thyme is Thymus serpyllum ‘Pink Chintz’ which I don’t find to be fragrant. I’ve added some lemon thyme though which is nicely scented. Hi Beth, I’m a fan of angelonia. So reliable. I have Serena Purple along the opposite side of the path. Last year I found a raspberry color that was nice but didn’t see it this year at the garden center. The path does look very inviting in the shade of the morning. Some of your thyme are still flowering, do you know which variety as mine finished ages ago. I don’t think a better camera is the answer to the light issues, contrast like that is impossible. I do love your circle! A couple of my beds are in spots with light issues as well. Part of a bed will be in dense shade, while the other half is in bright sun. I try to remember to shoot those beds either in the early morning or evening when they’re in full shade. I like your use of Angelonia as a bedding plant. I’ve always only used it as a tall element in containers. Maybe next year I should try it out in one of the beds. And of course, I like the Cleome! Thanks for the photography tip Kimberley. Angelonia works better for me planted this way. I have some in containers also, but I forget to water them. They don’t need as much water when planted in the ground. Ah, yes, the problem of remembering to water the containers! Most of my containers are on a covered porch, so I have to be especially careful to remember to water them even if we’re having a rainy spell! Lovely views! 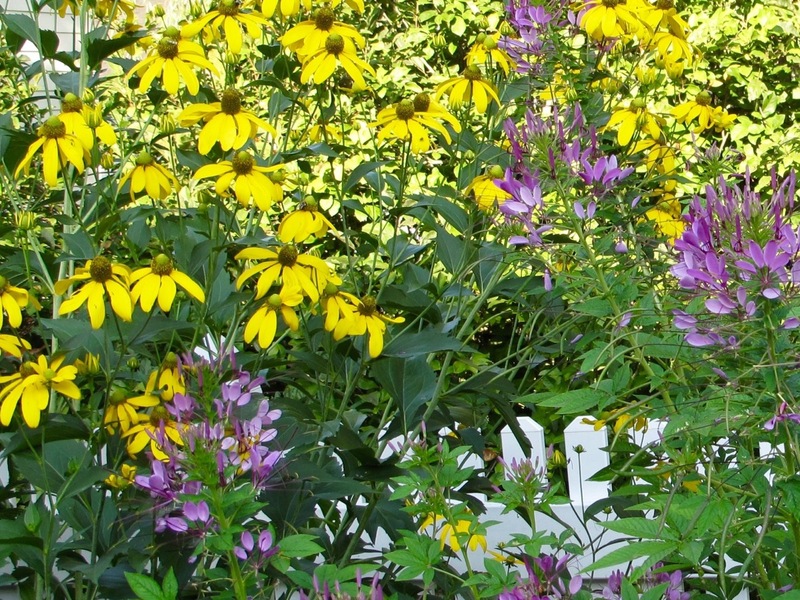 I really like the massed Angelonia and that Rudbeckia – always a favorite. The Angelonia rolls with the punches. It can take heavy rains or do without for fairly long times. The Rudbeckia’s color seems to be deepening recently to a wonderful golden.